Here are just a few examples of what Lacrosse Lamps can do with your old gear. Look on our new products page for lamps that are ready now! When is a lamp the centerpiece of the room? When it's a Lacrosse Lamp! A sure conversation starter, just like this one. While most Lacrosse Lamps are black, the white base makes lighter toned helmets standout even more. A classic looking finish to match more traditional rooms. 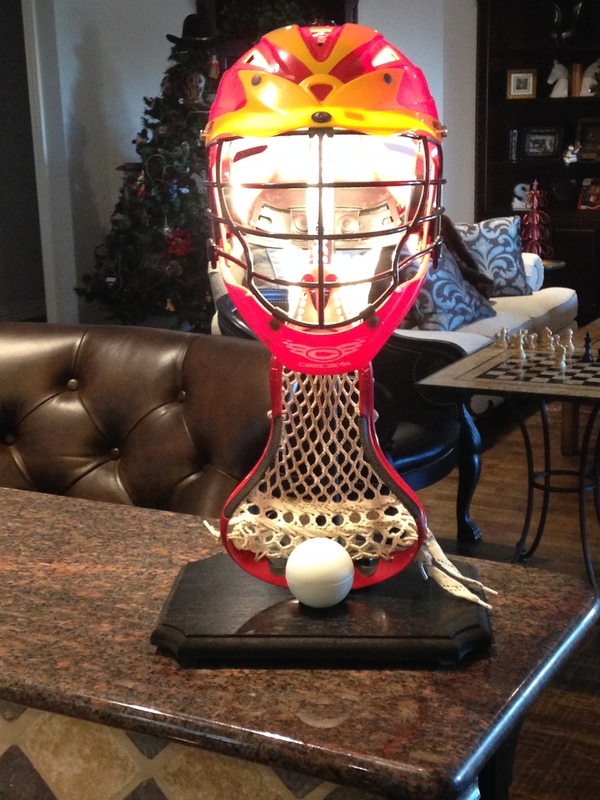 Remember your time in the cage with one of our goalie lamps. A fierce addition to any room! a double helmet lamp. We can also do two lamps, one for each helmet for the same price. Even if you have been out of the game for years, Lacrosse Lamps can source gear that fits your era. Many bedrooms have dual nightstands so why not get dual Lacrosse Lamp for each one? If you have the gear, great, if not, we can source your favorite team colors.